Prominent & Leading Manufacturer from New Delhi, we offer sweet display counter, plain display counter, vertical display counter, chat counter, display counter for sweet and namkeen and hot case counter. We take pleasure to introduce ourselves as one of the renowned manufacturer, trader and supplier of Sweet Display Counter. As per defined industry parameters, offered product is manufactured by our skilled professionals using premium quality components and modern technology.. Additionally, it is widely applicable in sweet shops, hotels and restaurants and can be availed in various technical specifications at leading market prices. The above mentioned price is for 48x27x52 inch with 4 shelves and made in SS material. Our company has gained name and fame in offering Plain Display Counter to the clients.The offered display is manufactured by our nimble professionals with high level of precision using top quality material in line with the globally accepted parameters. 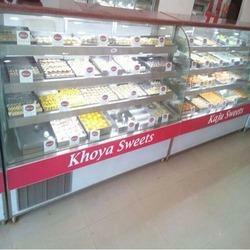 Our cake display is provided in numerous customize form as per customer’s needs. 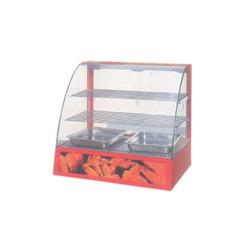 An exclusive range of Hot & Cold Vertical Food Display Counter is manufactured and supplied by our organization which consists of premium quality raw materials. With corrosion resistance and glass clear visibility, these counters show various food items as well as preserve the quality and hygiene of the food items. With various specifications, sizes and attractive models these are available at cost competitive price. With vast experience and knowledge we are involved in offering a premium quality range of Chat Counter. These are made using excellent quality raw materials and advance technologies. These are used in basically Restaurant, Food Street Corners, Hotel etc. Our customers can purchase these from us at reasonable price range along with the customized service options. The above mentioned price is for 48x27x52 inch with GM pan. We are the chief manufacturers offering an assortment of stainless steel pastry and Display counter for Sweet and Namkeen. 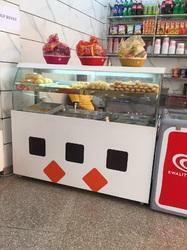 In these counters different varieties of sweets can be kept to display and which protects sweet from free from flies and dust. In order to ensure its high working capability, these counters are inspected against diverse parameters of quality in adherence to set industry standards. Our company holds expertise in offering Hot Case Counter to our valuable customers. The counter, offered by us, is manufactured from high-quality stainless steel, which is procured from well-recognized vendors. Owing to our proficiency in this domain, we are betrothed in offering inclusive assortment of Cake Pastry Counter. Acknowledged for their uses in bakeries, hotels restaurants and several other industrial applications, these are highly cherished. Furthermore, we inspect the complete consignment on varied grounds before final shipment of the order. Driven by technically advanced facilities at our ultra-modern manufacturing unit, we are presenting an extensive range of Cake Display Counter. Use for keeping cake, this cake display is test on specified guidelines in order to dispatch flawless range. The offered cake display is manufactured by our nimble professionals with high level of precision using top quality material in line with the globally accepted parameters. 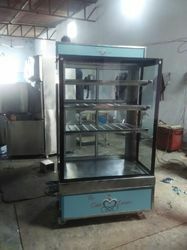 Our cake display is provided in numerous customize form as per customer’s needs. 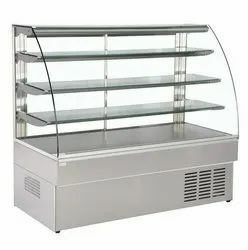 Our company has gained name and fame in offering Cold Display Counter to the clients.The offered display is manufactured by our nimble professionals with high level of precision using top quality material in line with the globally accepted parameters. 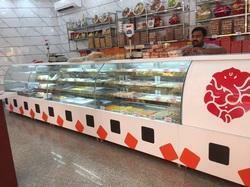 Our cake display is provided in numerous customize form as per customer’s needs.